Audis, generally speaking, are for people who demand absolutely top-drawer luxury — but who aren't especially interested in showing off. When a car like the 2001 S8 sedan rolls by, few people realize they've just been in the presence of a $72,500 luxury performance sedan packing a 360-hp V-8 engine and quattro all-wheel-drive. Try keeping a low profile in comparable machines: the Mercedes-Benz S55 or the Jaguar XJR sedan. You'll stand out like Don King's hair; you’ll be impossible to miss. This is a good thing or a bad thing, depending on what you're after. There's nothing wrong with flash and image, if that's what you're after. Both the Jag and the big S-Class Mercedes revel in their stage presence. If you don't notice them, it's time to visit the optometrist or check your pulse. But there's also a case to be made for keeping a somewhat lower profile. You know you are successful; does the whole world need to be informed? If this more demure approach to life describes your philosophy, the Audi S8 may be the best choice for you among its two principal rivals in the high-performance, ultimate sedan niche — and not just on this business of less ostentatious styling and bad-boy "rep."
All three cars are quite similar in their basics. They are large, powerful ultra-sedans that are essentially hopped-up versions of their various manufacturers' top models. The Jaguar XJR shares its body and most other things (interior layout, most suspension pieces, etc.) with its less-powerful XJ8 stablemate. What separates them is the supercharger bolted to the Jag's 4.0-liter V-8, which bumps the output from a middling 290 hp to a much more interesting 370 hp. Same deal with the Mercedes. The S55 is basically a modified S-Class sedan, equipped with a specially tuned (by AMG, Mercedes' in-house hot rod gurus) 5.4-liter V-8 that delivers 349 hp, about 50 more than the regular S500. Both cars also get suspension, wheel and tires, brake, and trim upgrades, among other things. This is precisely what occurs when an Audi A8 gets a makeover and becomes an S8. Same aluminum space-frame body; same overall dimensions and interior layout, etc. But when you chose the S8 over the A8, the 4.2-liter DOHC V-8 gets massaged to belt out the aforesaid 360 hp, or 50 more than the regular A8 4.2 (310 hp). There are also upgrades to the standard quattro full-time all-wheel-drive system, including an electronically locking differential, 18-inch wheels and beefier brakes, plus tires designed to make the most of all this potential, are all included in the S8's base price of $72,500. That’s $4600 above the base price of the regular A8 ($67,900) and a pretty good deal when you stop to consider all you're getting, and that Mercedes asks $98,000 for the S55 ($19,050 above the $78,950 base price of the S500). Remember, too, that neither Benz nor Jaguar offers all-wheel-drive, let alone gives it to you as part of the base price, as Audi does with both the A8 and the S8. Still, the Jaguar XJR is the most cost-competitive rival of the Audi. The car's $69,355 base price and standard horsepower (370) undercut and outclass the S8 in that department — but there's still no all-wheel-drive option, so the Jag is not the car for rainy days, let alone any lunatic attempts to make it to work when the flakes begin to fall. That said, the Jag is more thunderous as a straight-line performance machine, and will likely appeal to the kinds of people who drove American muscle cars back in the 1960s but who now have graduate degrees and real money to play with. The Jag, like a proper Detroit muscle car, can be made to perform tire-shredding standing starts, skittering off the line with the tail enjoyably sliding a little to the left, then back into line as the car hooks up. That will never happen with the S8 because of the quattro all-wheel-drive system. Losing traction just doesn't happen under almost any kind of normal street-type driving. And again, that's a plus or a minus, depending on your interests and perspective. If you want the ultimate in control, the S8 clearly fills the bill. All-wheel-drive offers such a competitive advantage on a racetrack that it has been banned from many classes. The downside is the car may be less fun to drive as a street car — precisely because it is so capable. It goes wherever you ask it to, always maintaining composure, never breaking the tires loose if you snap the throttle too abruptly, never sliding around in power oversteer, as can be done handily with the S55 or XJR. To get the Audi to slip at all (on dry pavement anyhow) you have to push it so far out there that there may be no coming back. The limits of the quattro system are far higher than those of most drivers, even really good ones, in fact — so when you push the car, you are really pushing yourself. There is an argument that new cars are becoming so capable that they are also becoming less enjoyable for the typical driver. That is arguably true of cars like the S8 — if, that is, you are considering buying one with the intent of actually using anywhere near the ultimate performance capability it offers. Again, it's a matter of viewpoint. The same all-out capability of the S8 also gives the car immense tractability (and thus a safety edge) on wet roads, in light snow — in dicey situations, such as when a driver misjudges a turn or freeway off-ramp and goes into it too fast. The S8 will save him in such situations — situations in which the rear-drive only S55 and XJR might slide right into the guardrail or into a ditch. Maybe it won't indulge lingering immature impulses to "lay a patch." But what the S8 will do is keep you on the road, unharmed and unembarrassed while delivering luxury refinement, build quality and features as good as these things get in today's high-end marketplace. 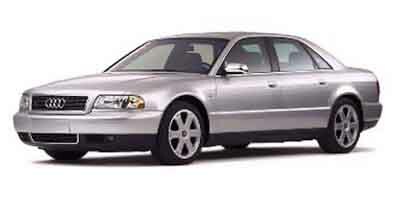 Major options on the 2001 S8 include the Audi trademark suede/leather trim package for an additional $3500; the satellite navigation system for another $1980; and an electric sunroof for the relative pocket change of $850. Looking for a different year of the Audi S8?